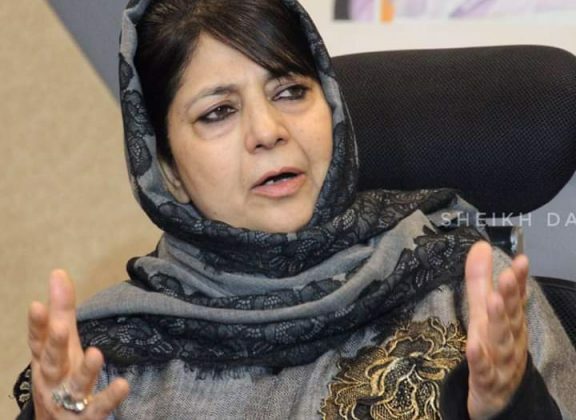 Former chief minister and PDP president Mehbooba Mufti on Monday while apologizing for her ‘toffee’ remarks, Monday said that she was not ready to join hands with BJP to form the government. “I had put some conditions for government before BJP but these politicians creating trouble inside PDP went to Nagpur and told them to bypass me thus compromising my position,” she said, adding that her condition included giving back power projects etc. She was addressing a rally in Bijbehara on the third anniversary of his father, Late Mufti Mohammad Sayeed. Mehbooba in her address apologised for her ‘toffee’ remarks that had generated anger among people. “If my comments, as a mother, have agonized mothers, sisters and brothers, I apologise. I am being criticised that she has said toffee etc but I said it as a mother. Mothers get angry when her kids don’t listen her,” Mehbooba Mufti said, according to KNO correspondent. She said that as a mother she felt pain when kids were killed and in anger she made those comments and she has been visiting people for long. She told the rally that people of Kokernag, Kulgam would remember that how her party saved them from bonded labour. She took a dig at Indian PM Narendra Modi saying he has wasted his mandate in India as well in Kashmir.